I have quite enjoyed every Sherlock Holmes story that I have read, and this one was no exception. 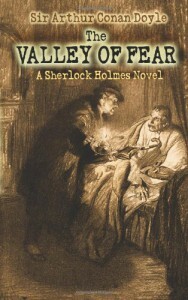 I will say, however, that I found myself a little disappointed at the end of the novel that we weren't going to get to see a bit more of a conflict between Holmes and Moriarty, which is what I thought the story was sort of driving towards. The extensive backstory about Jack McMurdo/Birdie Edwards was interesting, but not as engaging as watching Holmes in action. All in all, I would say this one was better than A Study In Scarlet, but not as good as The Sign Of Four or Hound Of The Baskervilles, mostly due to the two stories which split up the narrative.